Bison by Desmond Morris is an informative, sometimes amazing book about bison worldwide and their often tragic encounters with humans. Like Morris's earlier Leopard, also for the Reaktion Animal series, it takes a look at art and even at film, but is silent on bison in literature. I'll try to right that balance a bit here, but it's not going to be as easy as with leopards. Morris treats ecology, evolution, conservation, culture, history, and economics here, but his main interest is in graphic depictions of bison. Some of the oldest preserved art includes depictions of bison. Morris marvels at the paintings (and some 3-D models) of bison at prehistoric cave sites in France and Spain. He is especially taken (as so many observers have been) by the realism of this art, which can be far more like that of modern painting or even scientific illustration than the stripped-down or gussied-up images that comprise so much of humanity's depiction of animals. Art from much later periods is far more stylized, from the American petroglyphs at Newspaper Rock, Utah, to medieval European cartoons of bison shooting burning dung at their pursuers, to the Buffalo Bills' helmet logo. In all depictions, though, the bison's distinctive proportions resist extreme license. You can denote a bison, but it's hard to caricature one. 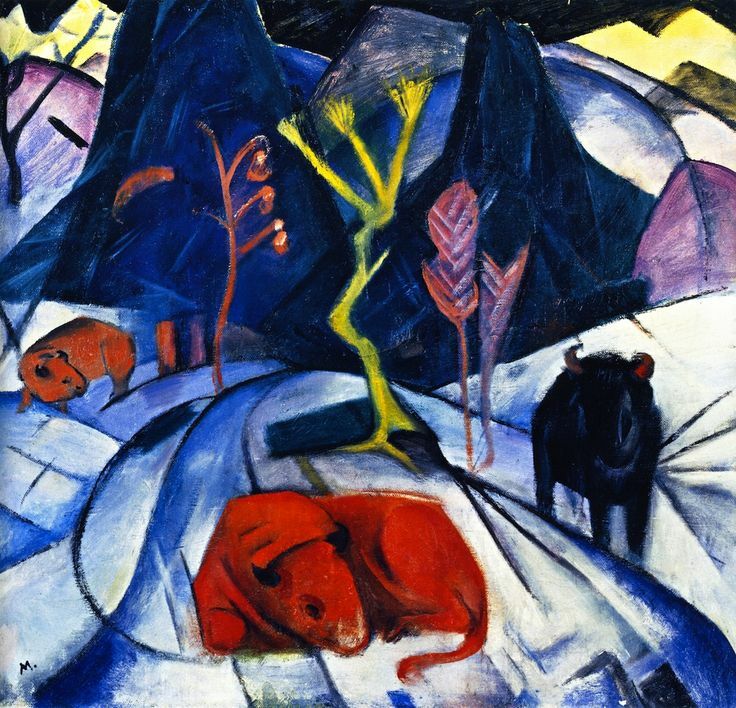 Morris notes that when Franz Marc wanted to paint a modernist, angular bison, he opted for fairly natural dimensions – and then, to make his beast distinctive, he colored it bright red. No study of bison can avoid recounting the ecological catastrophes that befell both the European and American species, and their comeback from the brink to a position of provisional security. In Europe the main problem was habitat loss, as forest clearing over the centuries reduced a continent-wide range to just a few forest preserves in eastern Poland. Shortly after the first World War, the European bison went extinct in the wild, and the second wiped out some managed populations and even many of the zoo bison, the victims of bombing. But heroic conservation measures over the past 70 years of peacetime have led to repopulation in many countries – even Denmark, where a herd roams in a preserve on the Baltic island of Bornholm. By contrast, the American bison fell prey to deliberate, ruthless hunting. Native Americans, even when equipped with horses and firearms, never made inroads on the vast prairie populations of bison. It took orchestrated campaigns by railway and ranching interests to reduce the North American herds to near-existinction. The slaughter was at once more brutal and less complete than that of the passenger pigeon: crueller and more fully organized, but ultimately pausing at the brink of extermination. By 1907, captive-bred bison were beginning to be resettled in Oklahoma's Wichita Mountains. Many other projects followed, with success, and ultimately the reintroduced animals formed the basis for the now-substantial bison-meat industry. Morris's Bison contains no recipes – it's an Animal book, not an Edible – but I could not resist fixing some bison chili after I'd finished it. It may seem odd to pay homage to a once-endangered species by eating it. But my willingness to pay $10.99 for a pound of ground bison is an important factor in the survival of the species. Though now mostly raised for market, bison cannot (yet?) be confined to feedlots: they can go from imperturbable to murderous without warning, rather like deer in that respect, so they're not fully domesticated. Bison are thus grass-fed and free-range by definition. And they're also like deer in being delicious. Bison chili is an umami-laden, sustainable, ethically-sourced treat that's worth the premium. I made mine with tomatoes, mushrooms, bell peppers, great northern beans, and quinoa, but I'm not giving out my secret mild chili-powder formula. Well, that was the kind of thing Hillaire Belloc did, and I reckon it's harmless. Though one should note that I've clipped those lines from a much longer verse paragraph that gets less affecting the more it rehearses its themes. Arthur Kopit's play Indians features Buffalo Bill Cody and his murderous claim to fame, though as the title suggests it's more about his dealings with humans than with bison. I honestly can't remember whether there's a crucial bison-hunt scene in any of Larry McMurtry's Berrybender novels, but they must shoot some bison along the way in those books; they shoot practically everything else. Captive bison are the "beasts" in the title of Glendon Swarthout's 1970 Young Adult novella Bless the Beasts and Children, their suffering parallel to that of the equally captive teens in the novel. And French novelist Patrick Grainville has recently published a novel called Bison (2014) about the buffalo-hunting days on the American frontier. Well, maybe there's a reason not to have done a chapter on the literary bison. Morris, Desmond. Bison. London: Reaktion, 2015.